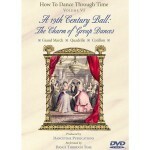 Volume VI of the How to Dance Through Time series reveals the interplay of flirtatious 19th century group ballroom dances, including the Grand March, Lancers’ Quadrille, and The Cotillion (Le Cotillon). This delightful video guides a choreographer in reenacting a stately and entertaining 1800s ball!An extravagant social event, dancers attending a ball, parade around the room to view prospective dance partners—and be viewed by others—in the Grand March. Next, learn the Lancers’ Quadrille, a popular forerunner to the American square dance. Comprised of five sections, it exhibits a wide variety of the period’s fluid, geometric patterns. Lastly, the coquettish Cotillon gives dancers many opportunities to pick and choose new partners in a complex, flirtatious series of dancing games.Most people who buy this DVD also buy the Companion CD.With 40 years of experience teaching and performing dance, Carol Téten provides clear instructions and entertaining context. As with all videos in the How to Dance Through Time series, the dances in Volume VI are introduced with a concise, historical overview and illustrated with authentic photographs and drawings. The steps were carefully researched from period manuscripts and are recreations of historical dances. Close up and slow motion views make learning the moves simple and fun. Form 2 lines: All forward and back, forward, turn partners to place. Give right hands to partners, return to place. Social dance, history, technique, and researched choreography all come together in Dancetime Publications’ latest videos… an ideal addition to any traditional ballroom dancer’s video collection. Dancing U.S.A. The organization of the material in each of these sets is first to go over each step of a dance several times in different tempos, from different angles, and with full explanations by the creator and head of the company, Carol Téten. You can watch, then skip back and try the steps yourself as you watch a second time, and over and over until you have it down pat. Brattleboro Reformer, Keene, N.H.